Biography of German Expressionist Painter: Worpswede Artist Colony. 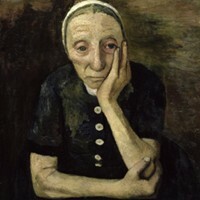 Heir to the Romanticism of 19th-Century German Art, Paula Modersohn-Becker joined the North German artist colony of Worpswede, before spending time in Paris where she discovered French Post-Impressionism as well as Van Gogh's style of Expressionism. Inspired by these variants of modern art, Modersohn-Becker developed a powerful style of primitive art which allowed her to create a range of expressionist compositions, primarily portrait art. Although she died young and sold few works in her lifetime, she is now seen as one of Germany's most important modern artists - a forerunner of German Expressionism, with an intensely personal view of the world. Among her best known expressionist paintings are: The Old Farmer (1903, Kunsthalle, Hamburg), Trumpeting Girl in the Birch Wood (1903-5), Reclining Mother and Child (1906, Paula Modersohn-Becker Museum, Bremen), Self-portrait with Amber Necklace (1906, Paula Modersohn-Becker Museum), Poorhouse Woman with Glass Bowl (1907, Ludwig Roselius Collection, Bremen), Kneeling Mother and Child (1907) and Woman with Flowers (1907, Von der Heydt Museum, Wuppertal). For more about how Modersohn-Becker pioneered the style of expressionism, in the first decade of the 20th century, see: History of Expressionist Painting (c.1880-1930). Paula Becker, the third of seven children, was born in Dresden to a cultured and intellectual family. In 1888 the Beckers moved from Dresden to Bremen, in the far north of Germany. After spending a short time at art school in London, England, and undergoing two years of teacher training in Bremen, Becker left home in 1896 to attend the School of Berlin Women Artists, visiting Worpswede for the first time shortly afterwards, in 1897. Worpswede was a rural village in the countryside of Lower Saxony, near Bremen. A small, close knit community, it had been colonized by a group of young painters - notably Fritz Mackensen, Otto Modersohn and Hans am Ende - during the early 1890s, who were attracted by its wild, moorland scenery, and by the unspoiled simplicity of its peasant environment. The artists painted the landscape, farmers and scenes depicting village customs. Their work could sometimes be bold and earthy, like that of the French painter Gustave Courbet, but more often it was sentimental, even romantic. At Worpswede, Becker studied figure painting with Mackensen (a painter of popular peasant scenes) and also met her husband-to-be, Otto Modersohn (1865-1943). Other Worpswede artists included Carl Vinnen, Fritz Overbeck, and Heinrich Vogeler. Several women artists worked at Worpswede. At a time when it was difficult for women to make careers as artists, it was often easier for them to work in such rural settings rather than in the academies of the big cities. Poets and friends of the artists also came to Worpswede, and the many surviving descriptions of the colony give the impression that it was an idyllic, creative community. In 1898 Becker went on a journey to Scandinavia. On her return, she settled at Worpswede. In 1900 she made her first trip to Paris, where she stayed for six months to train at the Academie Colarossi, sharing a studio with Clara Westhoff, who later married the famous writer Rainer Maria Rilke. She met other artists in Paris - including the German Expressionist Emil Nolde (1867-1956) - studied the Old Masters at the Louvre, and encountered paintings by Cezanne and Gauguin, which impressed her enormously. 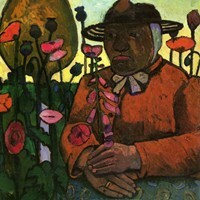 On returning to Worpswede she became engaged to Otto Modersohn, becoming Paula Modersohn-Becker on their marriage the following year. Modersohn-Becker was a determined woman and completely dedicated to her work as an artist, and often felt the need to live and work independently from her husband. Paris must have provided the excitement and stimulation that Worpswede could not give her, for she returned to the city in 1902 - this time to study at the Academie Julian - and again in 1903 to study at the Academie Colarossi. During her 1903 trip she was particularly impressed by Japanese art, as well as by the work of such modern French artists as Degas (1834-1917) and Rodin (1840-1917), whose studio she visited. Although she then returned to Worpswede for a while, she was soon drawn to Paris again. In 1906, for example, she spent a whole year there (even though her husband often begged her to come home), writing to her sister that this was the "most intensely happy period of her life". She returned to Worpswede in the Spring of 1907, where she gave birth to to her daughter, Mathilde, on November 2nd, but died of a heart attack a short while afterwards. She was 31 years old, and had been painting for less than 10 years. See also: Post-Impressionism in Germany (c.1880-1910). Modersohn-Becker's early work - mainly landscape painting of scenic views around Worpswede, and a range of genre painting of peasant scenes - was executed in the typically romantic style of the colony. But all this changed, as a result of her experiences in Paris, where she developed a powerful primitive style through which she was able to express her unique vision of the world. Inspired in particular by the works of Paul Gauguin (1848-1903), Vincent van Gogh (1853-1890), Paul Cezanne (1839-1906) and Picasso (1881-1973), she sought to create a radical, simplified style of painting. And like Cezanne and Pablo Picasso, she worked through her artistic problems by using simple, still-life subjects. Admiring what she called their "great biblical simplicity" as well as their resilience in enduring the hardships of peasant life, Modersohn-Becker frequently turned to the people and landscape of Worpswede in her search for subjects. She seems to have been especially facinated by the oldest, youngest and poorest residents of the village. Indeed, some of her most powerful images are portrait paintings of the old people from the local poorhouse, or of the skinny village children with whom she frequently played. In order to achieve a comparably rough simplicity in her work, she frequently used tempera (coloured pigment blended with egg yolk) rather than oil paint. It was only after her death that the full extent of her work was discovered; in her short working life she had produced over 400 paintings and about 1000 graphic works. Although she was by nature a loner, the sensitivity with which she treated her subjects shows that she had a great interest in individuals and in human relationships. Comparatively unknown at the time of her death, which occurred before the main achievements of Der Baue Reiter (Munich, 1911-14) and Die Brucke (Dresden/Berlin 1905-13), and centres like the Sturm Gallery (Berlin 1912-32), she is now considered to be one of the outstanding German artists of her time. In particular, her use of colour, distortion of forms, intense personal vision, and primitivist approach to painting, makes her - like Van Gogh - an important precursor of 20th century Expressionism. Paintings by Paula Modersohn-Becker can be seen in many of the best art museums throughout the world.  For biographies of other German expressionist artists, see: 20th Century Painters.  For more details of Post-Impressionist or Expressionist painting, see: Homepage.